← Are You Spending Your Life on Trivial Pursuits? Is the Current Church Model Doing More Harm than Good? The Barna Group just came out with a new research report. In it, they describe six mega-themes relating to the state of the church in America. I want to discuss two of those themes here. I believe they have a cause and effect relationship. 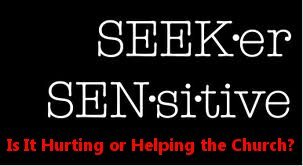 I also believe that the Seeker-Sensitive church model is directly responsible for the findings detailed in the Barna Report. 1. Growing numbers of people are less interested in spiritual principles and more desirous of learning pragmatic solutions for life. Barna’s research has found that people, by and large, are not interested in learning about their sin, their accountability to a holy God, His solution to their sin problem or how to follow the Savior. I would argue that it is the non-Christian who is uninterested in these things. Surely, the true, blood bought, ransomed, treasonous traitors turned adopted sons and daughters of the Almighty King of the universe care about such things? Though unbelievers may not be interested in these most relevant of all spiritual truths, they are interested in practical, pragmatic things relevant to their own lives. I don’t fault the unbeliever for wanting to know how to be successful, how to have a better marriage, how to be a better parent or any number of topics they are interested in. We are all interested in those things. 2. The Christian Church is becoming less theologically literate. My interpretation of the above is that the lack of theological understanding is going to get worse in the next ten years. Is that even possible? At first glance, the seeker-sensitive method sounds good. The motive: Let’s reach the lost is spot on. The method is what has failed. The results have been coming in and they are not good. I have to admit that early on in my preaching ministry, I actually implemented some of these ideas. I tried it out. I discovered the very same thing that the Barna report found. It doesn’t work. Sure our attendance numbers went up, but true discipleship and christian growth lagged far behind attendance. The Biblical model, contrary to the Seeker-Sensitive church model, is to continue to proclaim the message that people need to hear, even if they don’t know they need it. In 2 Timothy chapter 4, the Apostle Paul describes a time when people will no longer want to hear the message of the Gospel. They will not “put up” with listening to it, will want nothing to do with it, so they will “turn away” from it. Yet these same people will want instruction of some kind. Paul warns Timothy that these same people will “surround themselves with a great number of teachers” who will teach them “what their itching ears” want to hear. Does this sound familiar? Doesn’t it sound exactly like the cultural climate we minister in here in the United States? Paul’s admonition to Timothy was to not be one of the teachers they surrounded themselves with. I find this very instructive. What Paul was saying in essence was this: “A time is coming when people will not listen to the gospel. They will listen to other people teaching other things. But they won’t listen to the Gospel. So this is what you must do in that situation Timothy: you must continue to preach the gospel.” Even if they will not listen, Preach the Message of the Cross! For an exposition of this passage, listen to the message titled “Staying On Message” in our Audio Messages page. As church leadership panders more and more to the non-believers in their midst, the believers who remain begin to understand God and the gospel less and less. This is a failure of leadership and those being led must seriously consider leaving these types of ministries. The results are in. The Seeker-Sensitive Movement is dumbing down the American Church. Even Bill Hybels, the founder and guru of the seeker-Sensitve church model admits it, “We made a mistake.”. 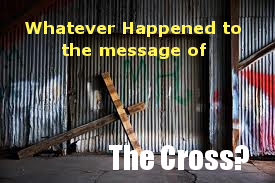 If you found this article helpful, you may also benefit from another related article called Whatever Happened to the Message of The Cross? For more on this topic see our Archives page. Posted on May 25, 2012, in Christianity and tagged christianity, El cristianismo, entertainment, faith, family, inspiration, leadership, Life, Purpose Driven, seeker-sensitive, spirituality. Bookmark the permalink. 4 Comments. I get the great falling away concept. I don’t know if I would agree with it as an explanation for the current state of affairs. Leadership seems to be leading us down the wrong path. We are the sheep, just following those who are suppose to know better. think of 2 separate paths being taken, one for those who want to follow closely to/with the Lord (and His will), and the other being taken by those who are leading down the path not of destruction but of their own will, of their own makings, of their traditions and doctrines instead of that path of Life in which the words that we speak are spirit and life. a falling away from the truth, of being led by men and what they think, instead of adhering to the Word of the Lord who leads us by His Spirit and truth. a falling away over time which has led to this state; a slow turning away which can be hardly seen, yet, over a period of time it has pulled away from the true course of which the church is to take, but is being govern by men instead and their wishes. I know I’m coming in this a little late, but I really don’t see a problem with a seeker-friendly (or however else you want to phrase it) church. I think the problem most Christians have with it is it is different then anything they’ve ever seen. They also tend to harp on the extremists in the movement. The watered down, God’s sole desire is to make you happy and comfortable preachers (I think we all know who i’m talking about. Hint: he has funny hair and a spinny globe). What is wrong with making the church attractive to people? We can all agree that people these days are absolutely not like your traditional church going folks. That is plainly obvious. If they do not respond to that tradition then we need to figure out what we need to do to reach out to them. One thing is technology. 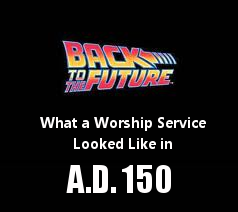 Why does the church have to slowly die because we won’t use an LCD projector or put a guitar on stage? Back in the 50’s we started putting piano’s on stage even to the disgust of the “old folks”. And going back to being practical instead of theological, I don’t know of any unchurched people who ask pastors, “what theology do you teach at your church?” Many of them don’t even know what theology means! People want to know how this book written thousands of years ago affects me and that’s what these churches do. You can not expect a non-christian to act like a christian and we CAN NOT look down on them because they aren’t as “deep” as us!! That’s why these churches choose to bring people to Christ by showing how God can be relevant to them. By loving on them. THEN we can start getting into the deep issues. If they come on the first Sunday and after a bunch of hymns that they have never heard before and have no beat (which they don’t relate to) they hear the pastor go into Pre-destination versus Blah Blah theology, I can bet they will be asleep before the alter call. My point is this. Are there churches who water down and stray from the gospel? Yes. Is that the case for every church? No. God’s grace never changes but his methods do. So why shouldn’t his church?